The following policies and guidelines set out specific details about how the EPA operates. 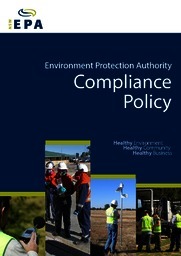 The EPA Compliance Policy reflects the agency’s values as an independent, accountable and modern regulator. It summarises the EPA’s approach to compliance and enforcement and explains how it works to achieve compliance and drive improved environmental performance. The Compliance Policy guides EPA decisions, ensuring its compliance activities and actions are consistent, fair and credible. Compliance strategies have been developed to guide the regulation of native forestry on both private and public lands. The strategies incorporate a risk-based approach to compliance which ensures the EPA focuses its attention and resources on those areas that pose the greatest risk to the environment or are of major concern to the community. The Compliance Plan 2018–19 (PDF 56KB) sets out the EPA’s compliance priorities for the year. maintain and improve environmental outcomes associated with the activities the EPA regulates. The Plan does not provide an exhaustive list of all the EPA’s compliance activities that will be undertaken during 2018–19. The EPA monitors compliance using various mechanisms, including community and industry reports to Environment Line. These reports provide details of potential environmental impacts and non-compliance. The EPA follows up on all issues and will take immediate action where it is necessary. Under the Protection of the Environment Administration Act 1991, the EPA is responsible for investigating and reporting on alleged non-compliance with environment protection legislation for the purposes of prosecution or other regulatory action. The EPA prosecution guidelines set out the factors the EPA takes into account in deciding whether, how and in what court to prosecute offences under the legislation it administers. The guidelines were developed and first published by the EPA Board in 1993, and then revised in 2001, 2004, 2012 and 2013. The EPA guidelines for seeking environmental court orders (2003) deal with sentencing options available for environmental offences, including investigation costs orders, publication orders and environmental service orders. The guidelines discuss the purpose of the orders and the principles the EPA will take into account in deciding whether to seek one or more of the orders. Enforceable undertakings are voluntary, legally binding, written agreements between the EPA and a company that or individual who is alleged to have breached environmental legislation. The agreement includes commitments by the company or individual, in response to an alleged breach, that are designed to improve environmental outcomes and prevent similar incidents occurring in the future. If you want to propose an enforceable undertaking to the EPA you must submit a completed application form. By submitting an application form you are inviting the EPA to consider an enforceable undertaking with you. You will need to refer to the guidelines when completing the Application form. All enforceable undertakings are made public and placed on the public register. You can also view the media releases for all enforceable undertakings the EPA has entered into. On 8 November 2017, changes were made to the Protection of the Environment Operations Act 1997 that make it clear that EPA authorised officers can use an unmanned vehicle, vessel or aircraft to carry out their functions. Under the Protection of the Environment Operations Act 1997 (POEO Act), the EPA can seek a court order to recover the monetary benefits an offender gained from committing an offence (section 249) once they have been found guilty of the offence in the Land and Environment Court. Monetary benefits are the financial advantage an offender gained over their compliant competitors. The EPA has developed a robust, standardised and transparent process for calculating and recovering monetary benefits in appropriate cases. The EPA Code of Ethics and Conduct is applicable to all EPA staff including ongoing, temporary or casual employees, contractors and volunteers. The EPA code is based on the code of ethics and conduct for NSW government sector employees produced by the NSW Public Service Commission. All EPA staff will conduct their activities in accordance with Government policies and the highest standards of ethical conduct. Our staff are bound by their statutory obligations under the NSW Government Sector Employment Act 2013, which dictates core values for the government sector and the principles that guide their implementation. The Ethical Framework in Part 2 of the Government Sector Employment Act ‘recognises the role of the government sector in preserving the public interest, defending public value, and adding professional quality and value to the commitments of the Government of the day’. The EPA Gifts and Benefits Policy states how the EPA deals with offers of gifts and benefits. The objectives of this policy are to provide clear and detailed guidance to EPA staff about what is a gift or a benefit and what their obligations are when offered a gift or a benefit, and to ensure staff act within their statutory obligations of the NSW Government Sector Employment Act 2013. The EPA does not use sponsorship as a primary tool in conducting its core business. However, under some limited circumstances sponsorship may be used to promote and achieve the EPA’s community, environment and business objectives. Partnering with a sponsor allows external participants to contribute towards the EPA’s initiatives. The EPA Sponsorship Policy (PDF 40KB) outlines the EPA’s policy on providing and receiving sponsorship. You should read this document to determine whether your proposal would be one that could be sponsored by the EPA. To evaluate sponsorship proposals, the EPA only accepts applications on the EPA Sponsorship Application form (DOC 173KB). This form has been designed to capture all the information required for the EPA to make an assessment as to whether the EPA will provide sponsorship to a third party. Complete this form and send the application to the appropriate EPA Branch (addresses are provided at the end of the form). This Grants Policy (PDF 584KB) applies to all Grant Programs funded by the EPA. The EPA uses Grant Programs to promote and achieve its community, environment and conservation objectives. The partnership between the EPA and a grant recipient allows external participants to contribute and participate in environment and conservation initiatives with the NSW Government. This policy outlines the EPA’s considerations when establishing and funding Grant Programs. The Privacy Management Plan (PDF 658KB) defines personal information and provides details about the privacy principles that the EPA follows when dealing with personal information. The EPA Compliance Management Framework (PDF 94KB) (the Framework) outlines the policies and procedures to be used by the EPA to ensure it complies with its obligations. These are to monitor, assess and report on internal compliance, rectify the causes of non-compliance and evaluate and improve the Framework. The Framework applies to all EPA staff including ongoing, temporary or casual employees, labour hire (contractors who are working as though they were EPA staff) and seconded staff. It does not apply to contractors who are not representing the EPA but are providing professional services to the EPA. The Framework does not apply to the Board of the EPA. The EPA does not accept workplace bullying from any of its staff, in any form. To enforce this strong stance an Anti-Bullying Policy (PDF 102KB) has been developed covering all EPA staff, including staff in ongoing, temporary or casual employment. Workplace bullying can be directed at a staff member or a group of staff members, and can occur inside or outside the place of work. The policy ensures that EPA staff fulfill their obligations to eliminate or minimise the risk of workplace bullying and provides staff with information on their rights and obligations and how bullying complaints are managed. The EPA aims to ensure that all of our staff can feel safe, encouraged and supported in their work and recognises the need to address a wide range of diversity and inclusion factors to achieve this. The EPA’s Inclusion and Diversity Committee has been the driving force behind the development of our Inclusion and Diversity Strategy 2019-21 (PDF 792KB), building on the priorities set out in the Strategic Plan 2017-21. The strategy will help the EPA achieve its 2021 vision to become an employer of choice, attracting and retaining the most talented people from a diverse range of backgrounds, ethnicities, genders and abilities. The Compliance Plan 2018–19 sets out the EPA's compliance priorities for the year.